Ivy McAllister had it all. Perfect boyfriend. Perfect life. Perfect future. Or so they tell her. Because one night, on a dark country road, a fiery crash changed everything…and Ivy can’t remember what happened. Now, two years later, at a new college far from home, she tries to regain control of her life, but her plans don’t include a tattooed, motorcycle-riding, indie music-obsessed guy with his own sorority girl fan club. Jon Priestly is the hottest guy at Pacific State University. Just ask his groupies. But with a dark past he must keep hidden, he shuts himself off emotionally and trusts no one. That is…until he meets a broken girl with haunting green eyes and secrets of her own. Ivy shouldn’t be attracted to Jon. They’re wrong for each other in every possible way. Yet as they spend time together, something about him—everything about him—feels so right. But when threats from her past make her question what little she does remember, Ivy must decide whether to run again or trust the one person she can’t live without. This entry was posted in Beth Hyland, Fall into Forever, New Adult Romance and tagged Beth Hyland, Fall into Forever, New Adult Romance on January 31, 2014 by BethHyland. 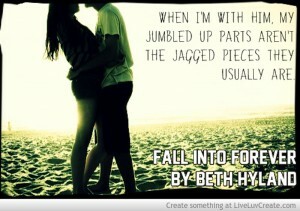 This entry was posted in Beth Hyland, Excerpt, Fall into Forever and tagged Beth Hyland, Excerpt, Fall into Forever, New Adult Romance on December 19, 2013 by BethHyland. I’ll be posting some writing stuff soon, but right now, I’m just getting familiar with how things work around here. This entry was posted in Uncategorized on December 13, 2013 by BethHyland.